It’s been five years since Ireland voted to keep the Seanad in a referendum, but not much has changed since. A POLITICAL COMMENTATOR who campaigned to keep the Seanad in the 2013 referendum, has said that he’s now not sure if the Seanad is worth saving. Five years ago, a referendum was held after Enda Kenny announced that the Seanad should be abolished. The majority of the public voted that it should be kept (51.7%), but a lot of the debate before and after the referendum called for reform of the Seanad. Since being appointed as Taoiseach, Leo Varadkar has made a number of comments to bring about Seanad reform, but nothing has definitively changed. A number of reports have made suggestions to improve the processes at the Seanad, including some that require a constitutional change. The Manning Report, which had a comprehensive look at what changes were needed in the Seanad, was published in 2015. Gary Murphy, Head of the School of Law and Government at DCU, who campaigned to save the Seanad in the last referendum on the Seanad, told RTÉ that after five years of seeing reports and proposals, he’s not sure whether the Seanad is still worth keeping. “We have yet another committee to examine that report… There have been other reports over the last 40 years, and lots of them have good ideas but I just don’t think there’s any political will. I’m deeply frustrated, disheartened, by it and I think there’s potential for the Seanad but as it exists I’m not convinced it’s worth saving. Murphy said he doesn’t see the point in getting involved if there were to be another Seanad referendum. I think the body politic has taken a view, that the Seanad… should be kept rather silent in the corner. I think it’s a waste of opportunity and waste of potential. A number of issues that have been discussed in the Seanad have made headlines over the past few years, including the infamous “scourge of seagulls” and regulating the sound of ice cream trucks. 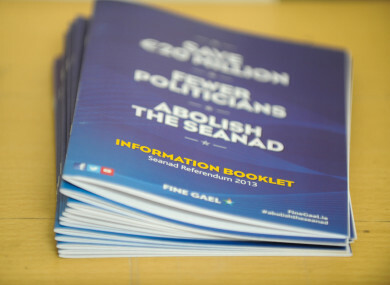 But the Seanad has also has dealt with serious topics such as the domestic violence bill, vulture funds buying homes from owners in mortgage arrears, and the Eighth Amendment referendum. During a discussion on RTÉ’s The Week In Politics today, Fianna Fáil Senator Lorraine Clifford-Lee said there have been 13 reports, a referendum and a discussion on what the Seanad should be, so “there is no real reason why reform can’t happen before the next general election”. Sinn Féin Senator Rose Conway Walsh said there has been “a lot of nonsense” around changes within the Seanad and accused Fine Gael and Fianna Fáil of blocking real reform. She said that the system to vote in senators in Ireland is “elitist” and said that Ireland should adopt the US approach, where the electorate vote for senators in a similar way that TDs are elected. Currently, the system for appointing senators is based on the nominations of 11 members by the Taoiseach, six are elected by university graduates and 43 in Seanad panel elections. There are 60 members in total. Judges, civil servants, and members of the Defence Forces and Gardaí are not allowed to serve as senators. Email “'Elitist', 'not sure it's worth saving': Slow progress of Seanad reform criticised”. Feedback on “'Elitist', 'not sure it's worth saving': Slow progress of Seanad reform criticised”.